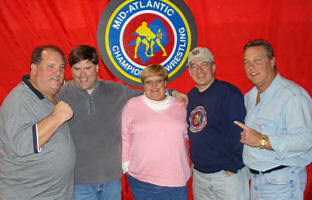 What a fun weekend in Rocky Mount, VA on November 3rd and 4th. 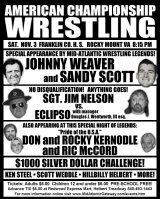 Johnny Weaver and Sandy Scott were making special appearances at an ACW wrestling show there, and friends Don and Rocky Kernodle and Ric McCord all dropped by to visit with Johnny and Sandy, and also to visit with fans. 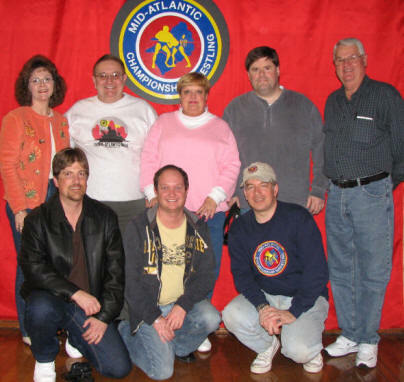 All are veterans of the Mid-Atlantic area and along with Jim Nelson, all worked together for Jim Crockett Promotions in the early 1980s. It was another World Wide Wrestling reunion, of sorts. 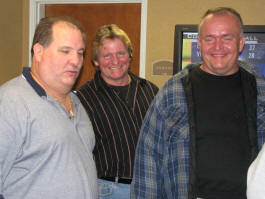 On Saturday afternoon, the Mid-Atlantic Gateway (along with Carroll Hall of WrestlingMemories.com) did an interview with Johnny Weaver that will be appearing on the Gateway soon. 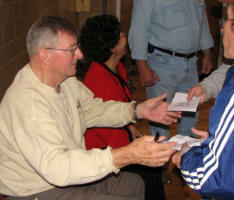 Johnny had brought his scrapbook with memorabilia from over his career that spanned over four decades. We had a blast looking through all those old clippings, programs, and photographs from the late 1950s through the late 1980s. 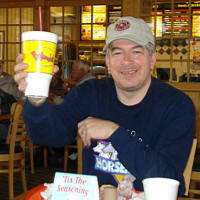 We enjoyed lunch together at the Olde Virginia Barbeque restaurant, a Rocky Mount landmark. 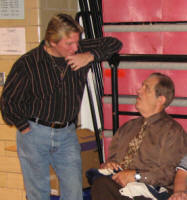 Before the wrestling event began at Franklin County High School (bell time is promptly at 8:15 PM just like the old days), Jim Nelson came to the ring and introduced all of the special guests that evening, bringing them out one by one as the old "Wide World Wrestling" theme music played in the background. It was special to see all these guys climb into the ring again. 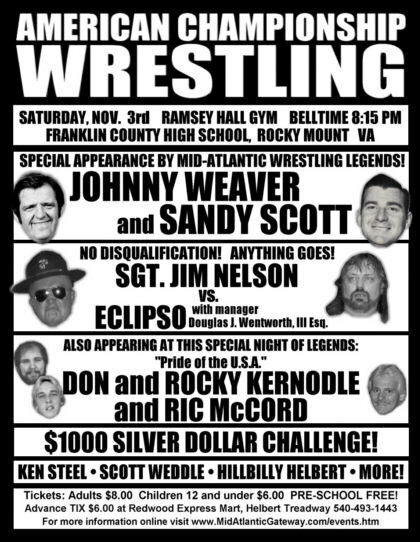 The wrestling show that night was the culmination of a storyline that had begun in the spring of this year in both Ken Steel's NICW promotion in Floyd VA as well as Eclipso's ACW in Rocky Mount. While ACW Universal champ Eclipso had refused to give Sgt. Jim Nelson another title shot, Johnny Weaver tricked Eclipso and manager Douglas J. Wentworth into signing a contract for a title match that night, which Nelson won. Weaver presented Nelson with the title belt in the ring, and Wentworth went nuts, threatening Weaver. When Eclipso tried to sucker punch Weaver, Johnny blocked the punch, shot Eclipso into the ropes and locked on his famous sleeper hold, to a big reaction from the crowd. In the next moment, Nelson caught Wentworth in the Cobra Clutch (taught to him by Sgt. Slaughter, of course), and the former champ and his manager were left nearly lifeless in the ring. Referee Ric Petty had to wake Eclipso up from the sleeper, just as Sonny Fargo might have done 20 years ago. Wentworth, on the other hand, may still be lying unconscious in that ring at Franklin County High School. The crowd was up from a normal ACW show, according to the promoter of the event. There are usually 75-100 paid at the shows in Rocky Mount, and if you attend independent wrestling shows, you know that's actually a pretty decent paid crowd. At this venue, the only seats are one set of bleachers along one side of the gym. I'd guess there were just under 200 there for this show, by 8:45 PM, the bleachers looked about full. 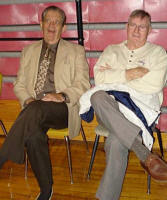 Jim Nelson's parents were on hand that night and got to see their son's hand raised by the great Johnny Weaver. 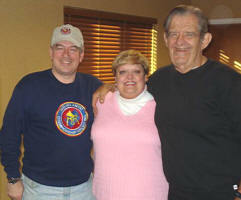 They also enjoyed a reunion with Don Kernodle who they had not seen in over 20 years. 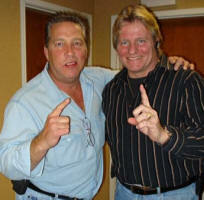 Kernodle had stayed with Jim at his parents home during the days the two were Mid-Atlantic tag team champions, Sgt. Slaughter's prize Marine recruits. It's worth noting that Eclipso is a veteran of the Mid-Atlantic area as well. Although never having worked for Crockett Promotions, Eclipso has been working and running independent shows since the late 1970s. He and Nelson and Ric McCord all broke into the business about the same time, and Eclipso has run shows in Virginia for over 25 years. He and McCord have huge collections of old wrestling posters from the 1970s, from the Greensboro Coliseum and the Starland Arena in Roanoke, featuring some of the biggest shows in those two building's history. 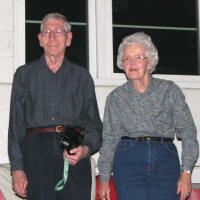 McCord even entertained some of us with some photos of his collection that he had on his cell phone. I was marking out for them, as I love those old event posters. 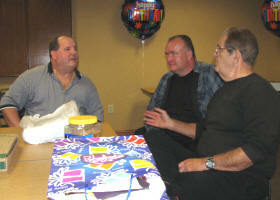 After the show, we had a surprise waiting for Johnny back at our hotel, a surprise birthday party that Peggy Lathan and I had been planning for months, with the assistance of Jim Nelson and his wife Tammy. 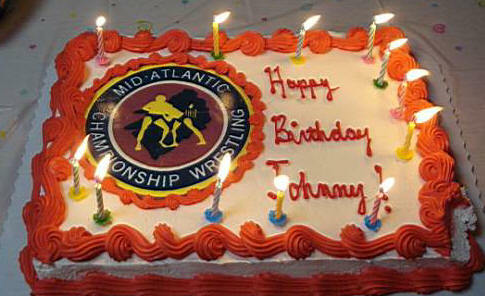 Johnny was really caught by surprise, and enjoyed cutting into his special Mid-Atlantic Wrestling birthday cake! It was a really fun time, and we were all up until about 2:00 AM listening to the boys tell stories from the old days, and looking at old photos. I even talked Johnny into singing a full verse of "Turn Out The Lights, The Party's Over" with me. This was caught on video tape, and may or may not ever see the light of day here! 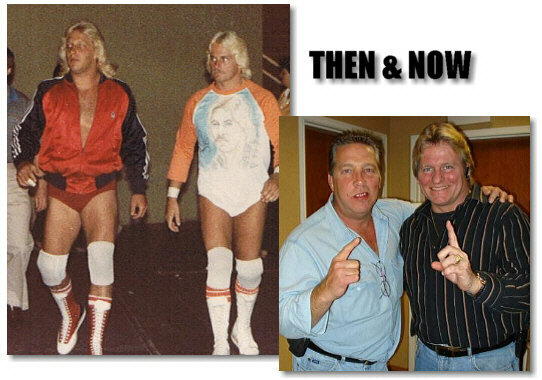 tag team combination in Mid-Atlantic rings in the early 1980s.